the wind was outside the bay. We’d anchored peacefully in Norman Island’s blissfully calm Benures Bay and were readying for our next anchorage. Wayne regulalry checks the weather reports before we decide to set sail, and even jumps through hoops to see them through a kludgy Kindle interface, when necessary. Yet we didn’t recheck, forgot which day the bigger winds were hitting, and instead decided to use the eyeball check. We saw some whitecaps outside the Bay, but the winds didn’t look all that strong. 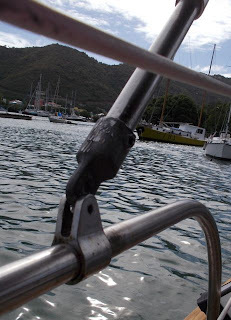 Blithely, we set sail with an unreefed (full – to better catch the wind for more power) mainsail and a full jib. As we approached the bay’s exit, entering St Drake’s channel entrance, we dipped our rail! * That is is not easy to do on our Pearson, known for its upright stability. It was the first time for us, and we’ve sailed our Pearson for five months, several hundred miles through a dozen countries! *For non-boaties, the means the highest outer edge of the boat side (hull) leans over so far it gets dunked into the water. 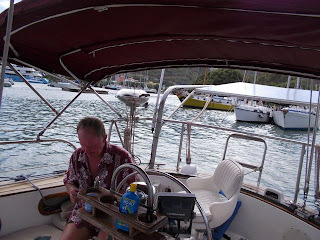 Wayne promptly u-turned Journey back into placid Norman Island Benures Bay, double-reefed the main, ratcheted down and tightened up the jib (for non-boaties – we put out a lot less sail and rigged it stiff enough that the wind could not push it as easily). Even still, several times we came within 1-4 inches of dipping our rail again. We tacked to reach our intended destination and were unable to make up the distance. 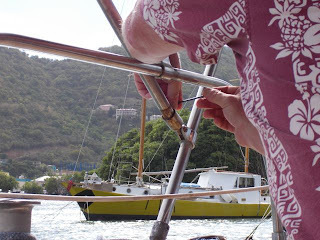 Rather than being stubborn about it, we decided to just take the short downwinder to Tortola's Road Town Harbour rather than fighting upwind to Fat Hog's Bay. We were a little bummed, as wanted another go at Fat Hog's cruiser-friendly awesome laundromat, closeout special provisioning, and free wifi. We were very grateful for our recently replaced standing rigging! Sure, we’d hoped we could wait and do it more cheaply than the $3,000+ we spend between Pointe A Pitre Guadaloupe and in Sint Maarten. But it felt good to confidently take on these strong gusts without fearing for our masts stability. As we approached the harbor, the howling wind got in one last malevolent lick. A bracket holding a side arm of our bimini broke. 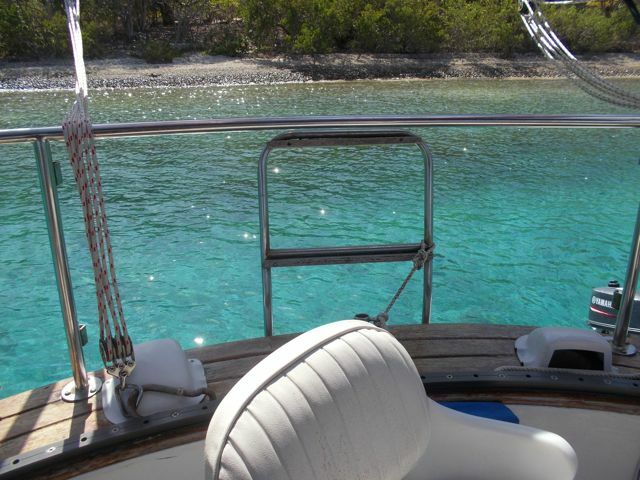 Our bimini nearly became an additional unofficial sail and practically took flight! Inner Road Harbour was blissfully calm;). Still, we were pretty frazzled by the time we dropped anchor. 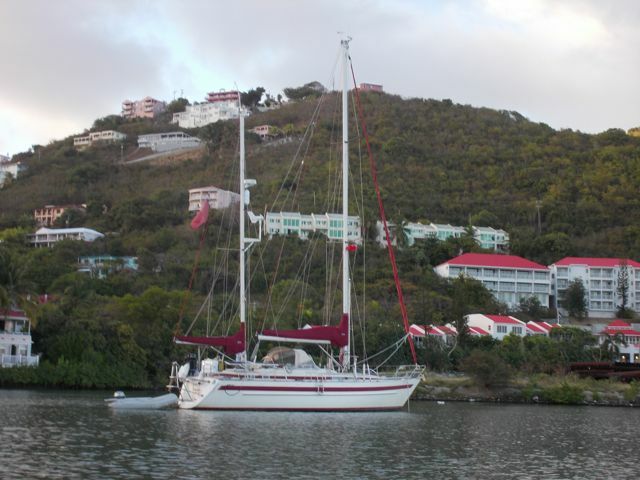 Sheryl, anchored in Road Harbour, Tortola. 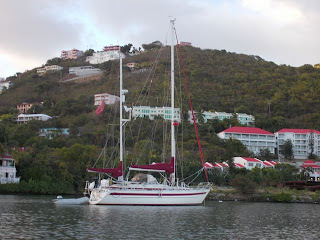 Serendipitously, anchored nearby was Emma Louise, a ketch we’d eyed a few days earlier elsewhere in the BVI. Wayne was curious about how they were able to accommodate both the mizzen sail and their windvane; he was hoping to talk with Emma Louise’s captain about it. Emma Louise’s captain, Steve, and his wife Sheryl pleasantly obliged. As Wayne suspected, Emma Louise is a well-traveled boat, which crossed the Atlantic several times. He picked Steve’s brain, and took notes for an hour or so. Their website is www.EmmaLouise.info. “You know, it was definitely gusting to 30 knots or more today,” Steve noted. My windvane takes on a particular pitch when it gets that windy, and it did make that high pitched whine on our passage.” For non-boaties, 30 knots on the Beaufort Scale is considered “near gail”). So, were definitely weren’t underestimating the conditions – once we were in them, that is! 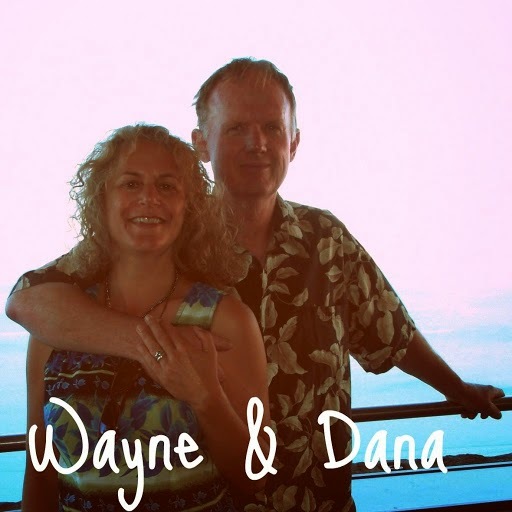 The red fabric over Wayne’s head is Journey’s bimini. for Wayne to work loose for replacement. Later, at a chandelry in Road Town, Wayne bought a replacement and spare bimini bracket for $6 each; the same thing cost $23 for a single bracket in Rodney Bay! We got off fairly cheaply for our little misadventure. Ultimately, our passage was only about 7 miles, including the extra for the tack, but it was a loooong 7 miles. In hindsight? Get a current weather report, especially before setting sail from a well-protected bay – the eyeball assessment may be deceiving. 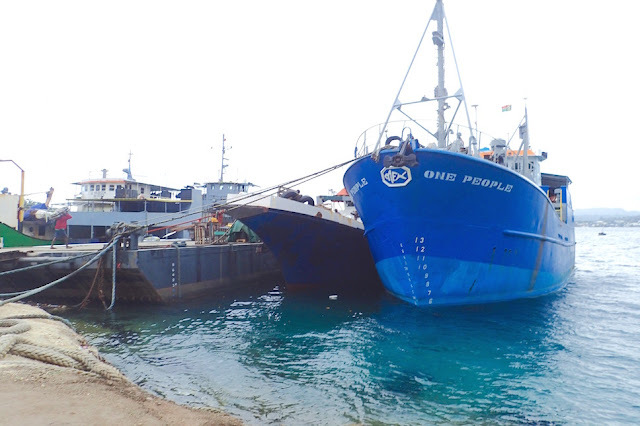 Failing that, the smarter course was and in the future will be to re-anchor after our u-turn and wait it out! We learn;). Thanks! Definitely learned some lessons. In the grand scheme, we got off pretty easy. Wayne! Be smart!! Dying ain't why you two went down there.